It doesn’t matter if you come to Pfingstberg from Potsdam’s Central Station (Hbf) by tram, bus, bicycle, or on foot – even on the most direct routes you’ll encounter myriad visual delights and experience the city’s sights from the outside all along the way. Traveling from Potsdam’s Central Station (Hbf) to Pfingstberg – possible by bike, on foot, or with the tram – is, above all, a diverse architectural journey through various epochs. You’ll experience impressive Neoclassical and Baroque architecture in the city center, before taking a small break in the idyllic Russian colony Alexandrowka. Then, when you’re refreshed, you’ll go on to explore Pfingstberg with its Belvedere Palace and Temple of Pomona. Rent a bicycle at S-Bahnhof Griebnitzsee and enjoy nature and history together, on a tour filled with shimmering lakes surrounding the most beautiful historical buildings. Along the Glienicker Lake, the Havel River and the Heiliger See (lake), you’ll discover beautiful villas as well as other architectural monuments of the Prussian Kings. At the halfway point, the Glienicke Bridge, take a break for refreshment with something hearty or coffee and cake, and then continue your relaxing ride along the New Garden to the Belvedere on Pfingstberg. After your visit to Sanssouci Palace you can also get to Pfingstberg on foot or by bicycle along a very scenic route. 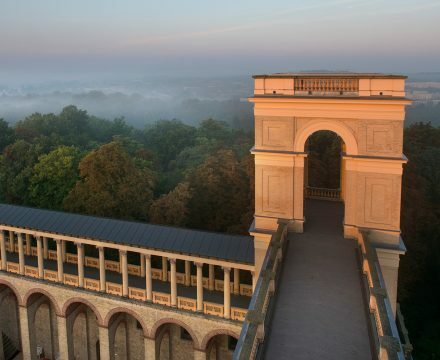 From Frederick the Great’s Ruinenberg you’ll have an idyllic view of Sanssouci Palace. Refreshments and snacks amidst the historical dwellings at the Russian colony Alexandrowka are on offer. Then enjoy the abundant greenery and small gardens in the Volkspark Potsdam. And finally, reward yourself by partaking in the grandiose view from the Belvedere – Pfingstberg. Book an individualized Potsdam bike tour, including an Italian picnic, and a bike ride ascent up to the Belvedere – Pfingstberg. It’s a special offer for connoisseurs! Start your day-trip excursion with an Italian picnic basket to accompany you on a delightful bike tour through Potsdam. Make use of a bicycle city map or a free audio guide app and discover Potsdam completely at your own pace and suited to your interests.